India. The name instantly evokes associations and images in our minds. India has painted its colors on nearly every aspect of modern Western life. The food we eat, how we decorate our homes, what we wear, how we exercise, the movies we watch, the technology we use, and the religious options available to us have all been influenced by the many cultures and peoples of India. Seen from afar, perceptions of India may be based on overwhelming statistics on population and snapshots of poverty; technological competition in the global market; exotic art forms; and ancient history. All this is true. But at its heart India is its people. Mother India’s 1.2 billion “children” are as varied and colorful as the spice markets of Old Delhi. Each region, caste, and community has its own culture, reflecting unique histories shaped by conquest, creativity, and religion, expressed in distinct languages, social customs, art forms, and expectations of life. Steeped in tradition, exceptionally fatalistic, and intensely passionate about their culture, Indians are some of the most ingenious, adventurous, and creative people on the planet. Warm and friendly, most will respond to your interest in them and their country with generosity and genuine friendship. But they also have indelible ties to family and community that form boundary lines and determine decisions that do not always seem reasonable, from the outside. Visitors’ responses to India can be as extreme as the people and places they encounter there. 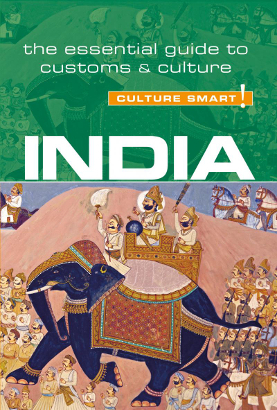 This book aims to make you aware of the basic values and behavioral norms, to show you how to navigate cultural differences and connect with real people, and to offer insights into the sometimes frustrating, but endlessly fascinating, place that is India. Try not to be in too much of a hurry. Change your expectations when it comes to timing; whether for social meetings or business appointments, don't get upset when things start later or take longer than planned. Indian Stretchable Time is a fact of life and one that is wise to accept rather than attempt to challenge.